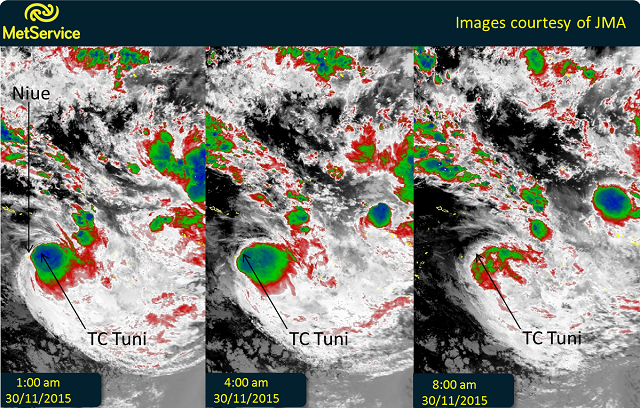 The centre of Tropical Cyclone Tuni was located around 160km northeast of Niue at 9am this morning. Rainfall at Hanan Airport, Niue, in the six hours to 7am this morning was 88mm. The average wind speed at that time was 50km/h. TC Tuni is now traveling southeast at about 23km/h. Still classified as a category one tropical cyclone, the central pressure is estimated to be 993hPa. Winds close to the centre are expected to be 75 km/h gusting up to 100 km/h. You can see the forecast track of the cyclone below. On this track the centre is expected to lie about 160km east of Niue this evening, and about 190km east of Niue tomorrow morning. A gale warning remains in place for Niue. The images below show that the upper clouds of TC Tuni have begun to be blown away by strong upper level winds. The winds close to the centre are expected to decrease to 65km/h in the next 6 to 12 hours.